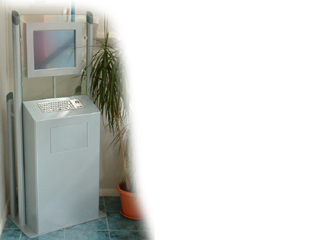 i-Touch V37-D Hybrid Metal and Glass Floor standing kiosk with 15'' screen - Future Generation Kiosk Products. extend the unit and add a raised secondary screen. The v37 is ideal where style is important and modern surroundings are present and you require flexibility for a range of installable options. As shown, this unit will accommodate options such as keyboard, printer and card readers, as well as a secondary LCD or Plasma screen if the extension poles are fitted. The unit is also available with a 17 inch screen upgrade. Please view the mini site to see the extension pole upgrade.